Still in the clouds! Can’t believe it’s already been 2 weeks since our wedding! Last night, our incredibly talented photographer @ashabaileyphotography came over to go through the rest of our wedding photos and I was literally sitting in front of the screen shedding happy tears, reliving our best day ever! So much love, so many funny little moments we reminisced about! It’s been the hardest thing to choose our favorite photos! Since we still have so many more to share, I decided it would be best to divide everything into three different posts; our Pre-Wedding Shoot, The Ceremony and The Reception. I can’t wait to share more of some of our most special moments with you in the following weeks, and so glad I’ve had you guys along, every step of the way with me on Instagram ♥. Today I wanted to share our pre-wedding shoot, 24 hours before we walked down the aisle. 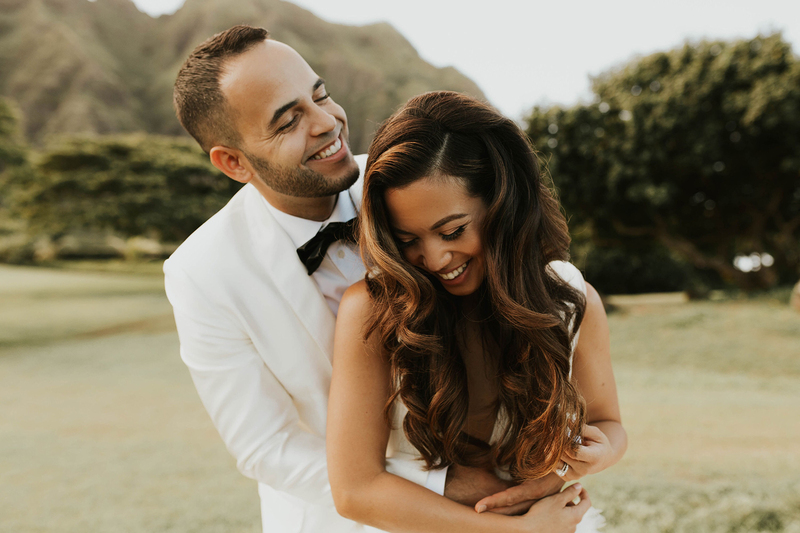 Asha our photographer did tons of research ahead of time to find the perfect location in Oahu and it couldn’t have been more ideal for this day. So close to the big day, it felt good to just get away before all the madness began! Asha was amazing to work with in the flesh. Her direction and confidence behind the camera made G and I feel relaxed and very comfortable, and the romance just poured out! Now for my gown! 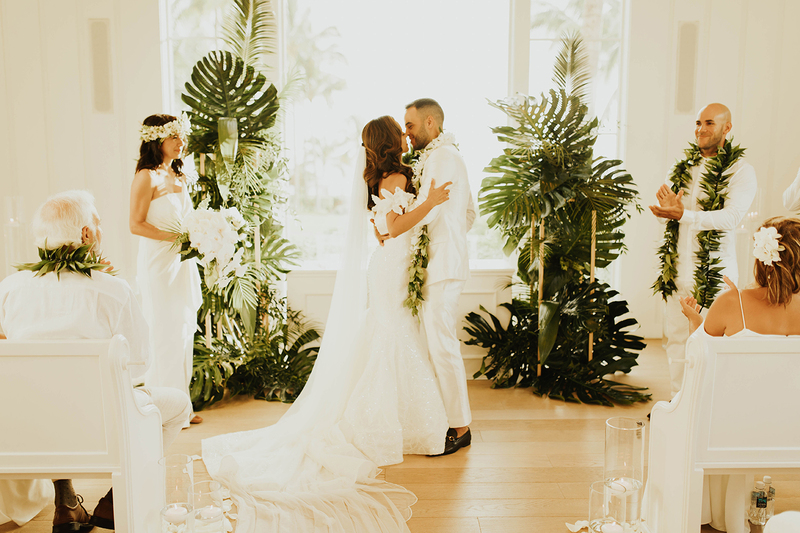 For about a year I had been working with Pronovias to find the perfect gown for our big day…the problem was I found not one, but three I was completely in love with! The first of these was the Clemence Gown! From the moment I put it on, I knew it was right! Everything from the plunging neckline, v-back, and massive tulle train was absolute perfection! 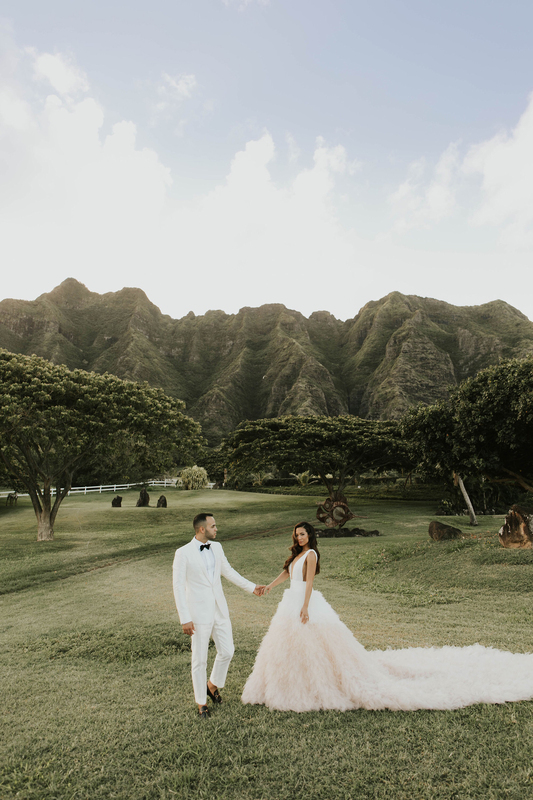 I loved the way the subtle shades of blush and lavender looked against all the greenery and mountains, truly a dream!! As some of you know, Hawaii is a special place for G and I! We chose to have our wedding here because this is the place where we fell in love, our happy place ♥. We can’t THANK YOU enough for all of your sweet messages, comments, and support, our hearts are so full!! Whether you’re a new reader or have been with us since the beginning, thank you for being part of this journey with us. Stay tuned for the ceremony and reception recaps and our official wedding video! I am so so happy for you Jessi! Congrats on your beautiful wedding and all the love in your life. You look incredible! I can stare at these photos forever! Congratulations on your glorious and beautiful wedding Love … may many more joy and happiness keep on sprinkling upon this celebration and sacred bow of true love ♥️ forever more. So Far and Pretty look. Where can I find the details on your wedding makeup? Looks flawless!!! Thank you babe <3 I'm obsessed with the gown and the hair stylist did an incredible job :) Thank you for stopping by!! What a gorgeous couple. You really are a goddess dear! Girl you are the most beautiful bride ever! Awww you’re too sweet, thank you love!! Congratulations! You look so beautiful and photos are fantastic. Jessi first of all, congrats on your big day!!! your wedding is definitely one of the most beautiful ones I have seen this year. It’s like a fairy tale becoming true. The setting, your dress, everything was just so perfect!!! You two make such a perfect couple! Cutest shooting ever!!!! 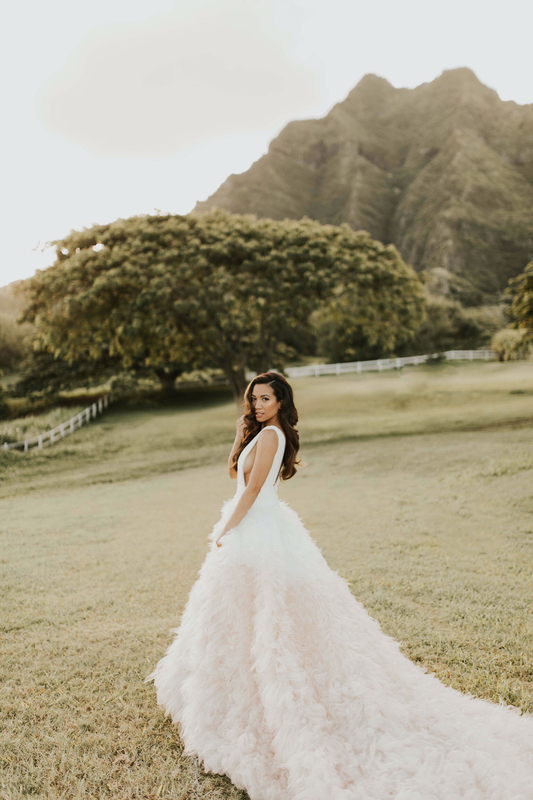 Love your dress Jessi, a dream!